Ghibli Blog: Studio Ghibli, Animation and the Movies: Conversations on Ghibli Birthday Contest! Conversations on Ghibli Birthday Contest! 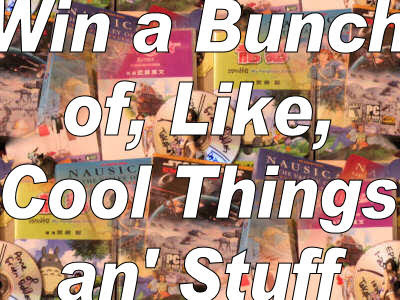 To commemorate the blog's first anniversary, I'm giving away a collection of, well, everything. Paintings. DVDs. Books. Fansubs. And this weird frog thing. I really don't know what it is. 1) List your Miyazaki/Takahata Top 5. It can be anything and everything, from Toei Doga to Studio Ghibli. Horus, Lupin, Heidi, Conan, Gauche, Nausicaa, Totoro, Fireflies, Howl - anything goes. 2) Write a short note or essay about your favorite. Which is your number one, and why? You don't need to write a full-scale movie review (like reciting the plot), just share your love with us, speak from the heart and your own experiences. When the contest is over, I'll compile all the votes and share some of your notes here on the blog. Send your Miyazaki/Takahata Top 5, and your favorite essay, to d.thomas1973@gmail.com. This contest runs through the month of April. The final day is May 1. Pass the word! Let's see who is the most popular! First prize is a new car. Second prize is a set of steak knives. Third prize is you're fired. 1st Prize - An R3 DVD of Omohide Poro Poro. A Kiki tote bag, perfect for showing off your new DVD. And an actual Daniel Thomas painting from my vaults. Probably a watercanvas. Next up is the Mystery Disc. What is the Mystery Disc? What kind of stupid question is that? It's a Mystery Disc. Could be anything. Even a boat. But it's on a DVD-R, taken from my movie collection. One of the imports, that's for sure. Finally, the dvd-rom Fansub Collection. This package includes: Horus, Prince of the Sun; The Flying Ghost Ship; Lupin III (series 1); Future Boy Conan; Anne of Green Gables; the Nemo Pilot; Ghiblies 1; and a collection of Hayao Miyazaki comics. Oh, and I'll throw in the divx codecs and the VLC Media Player so you can actually watch this. 2nd Prize - The 4-book set of Nausicaa of the Valley of Wind. This is the older Viz release, which was replaced by the larger 7-book set. So, basically, you're getting my backup copy. Sorry, Kui. Kai is dead. Just for kicks, I'm throwing in one of the toys YesAsia sends me with each order. I've got four, you'll get one of 'em. Also, you'll get a Mystery Disc, the dvd-rom Fansubs, and one of my paintings. 3rd Prize - An R3 DVD of Whisper of the Heart. Good for you. You also receive a Mystery Disc, the dvd-rom Fansubs, and one of my paintings. Oh, and you get the second of the four YesAsia toys. Might be the hot anime girl. Might be the cop car. You don't care. 4th Prize - An R3 DVD of My Neighbor Totoro. Happy, happy. Joy, joy. You also get a Mystery Disc, the dvd-rom Fansubs, and one of my paintings. You better not sell it to Sotheby's. Oh, and you get the third of the four toys. Maybe you'll get the frog. 5th Prize - The PC game Star Wars: Empire at War. This was a Christmas gift, so don't go bragging to your friends that I spent a lot of money on you. I only paid for postage. Oh, you get the last toy, the Mystery Disc, the dvd-rom fansubs, and one of my lousy paintings. 6th-10th Prize - A Mystery Disc, the dvd-rom Fansubs, and one of my lousy paintings. No, you can't have my Pink Floyd and Cream records. 11th Prize - You're fired. Sent my list in... Are we supposed to get any kind of confirmation e-mail?